We all know that there is a provision in Windows operating system to automatically lock the PC when it’s idle or inactive for a certain amount of time. The option, when enabled and configured, automatically locks your Windows PC after a pre-defined period of inactivity. Although the method is useful to some extent, it doesn’t lock your PC as soon as you walk away from your PC. For instance, if you have configured your Windows 10 PC to automatically lock after 5 minutes of inactivity, anyone can access your PC before the PC automatically gets locked. As a workaround to the problem, Microsoft has introduced a new method to automatically lock your Windows 10 PC as soon as you walk away from your PC. The new feature is Dynamic Lock, and is available in version 1703 and above versions of Windows 10 only. According to Microsoft, the Dynamic Lock feature works using the proximity of a Bluetooth-paired phone. When the Bluetooth-paired phone is not found around or whenever it’s out of range, the Dynamic Lock feature automatically turns off the screen and locks your Windows 10 PC after 30 seconds. In other words, when you step away with your Bluetooth-paired phone, Dynamic Lock feature turns off the display and locks your Windows 10 PC after 30 seconds. Of course, if you walk away from your PC by leaving your phone behind, Dynamic Lock feature will not lock your PC. It’s important to note that you first need to pair your smartphone with your Windows 10 PC which requires Bluetooth. So, your PC must have Bluetooth hardware in order to use the new Dynamic Lock feature. Most of the modern laptops and tablets have built-in Bluetooth. If your PC does not have Bluetooth hardware, you can connect an external Bluetooth USB adapter. Follow the given below directions to turn on Dynamic Lock feature on your Windows 10 PC. 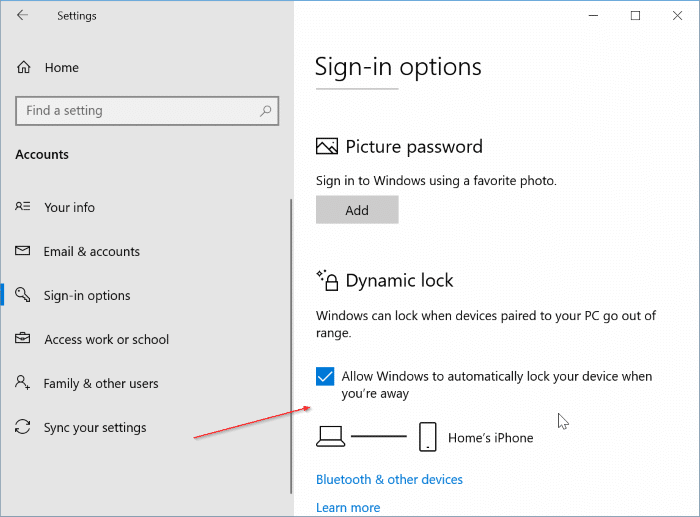 Step 1: Since the Dynamic Lock feature requires a Bluetooth-paired phone, you first need to turn on Bluetooth on your Windows 10 PC as well as phone, and then pair your phone to it. For detailed instructions, please refer to our how to pair your phone to Windows 10 PC via Bluetooth guide. Step 2: Open Settings app. Navigate to Accounts > Sign-in options. Step 3: In Dynamic lock section, check Allow Windows to automatically lock your device when you are away option. That’s it! NOTE: If the Dynamic lock section doesn’t appear on the Sign-in options page, it’s likely because you are running a version older than 1703. It could also be because your PC doesn’t support Bluetooth. GateKeeper by Untethered Labs does this with a key fob rather than using the phone.